Colonel Blimp—newly re-released by the Criterion Collection—packs emotional depth and a touch of magic as it tells the story of two men's true friendship in wartime. Britain's usually thought of as the runt of the power countries in film history. Its cinematic output trails, by a wide margin, the CVs of America, France, Russia, and Japan. There was the Kitchen Sink movement of the late 1950s, which was incendiary in its way, but before that, British films tended to fit their country's stiff-upper-lip stereotype. Which is what makes 1943's The Life and Death of Colonel Blimp all the more surprising: England's greatest film ever, it turns out, is an emotional epic. It's pretty rare that two filmmakers co-direct, co-write, and co-produce—or, at least, share a title card saying that do—but so it went with Michael Powell and Emeric Pressburger, close friends who dubbed themselves The Archers. The British Powell directed; his Hungarian partner, Pressburger, wrote; both produced. Pressburger's scripts tend to be almost novelistic in scope, with myriad turns and characters from earlier portions returning for later bits, but with a feeling of order and concision. * Needed honing came courtesy of Powell's camera, a peppy traveler with a penchant for wonder and a bardic soul. All of this means that The Life and Death of Colonel Blimp is especially suited for its new release from Criterion on Blu-ray, a transfer that might be the sharpest the company has done yet. The plot ought not to work as well as it does, considering its range, but Pressburger knew how to cram a lot of story into a short amount of space through subtle layering, making it feel almost like several films have been superimposed into one. The movie is tripartite in structure, with an intro and a reprise—with fresh parts—as a coda. The titular fellow would have been familiar to all Brits as the subject of a popular cartoon strip. But this Blimp—a.k.a., Major General Clive Wynne-Candy, played by Roger Livesey—is a long way from the funny pages, even if his younger self likes a good joke. We first see him as an old man, doing training exercises in WWII-era London, and being upstaged by a Johnny-come-lately officer. Then we journey back to the turn of the century, courtesy of a tracking shot across the waters of a Turkish bath that knits the present to the past. On leave from the Boer War, Candy, as just about everyone refers to him, goes to Berlin to try and put a halt to anti-British propaganda. 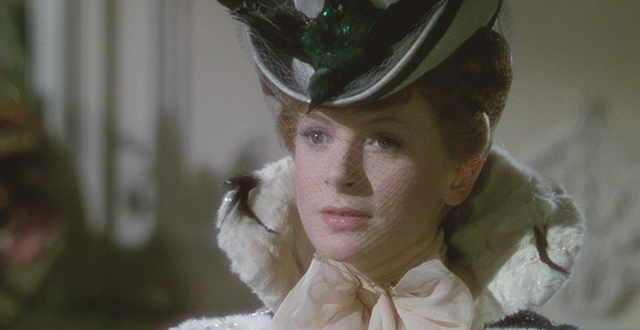 There he meets Deborah Kerr's Edith Hunter, a fellow Brit, and ends up fighting a duel against a man he has never met. Said man—Theo, played by Anton Walbrook—and Candy convalesce in the same nursing home after carving each other up, and become close friends. That's even though Theo announces his engagement, in broken English, to Edith, the woman that Candy loves. The build-up to the duel is both comical and terrifying in its detail, but when it's time for the rapiers to start flying, Powell's camera simply up and leaves through the roof of gymnasium where we have sat in so much expectation. You don't need to see this, it seems to say. Let me take you over here to what is more important. The blows do not matter; not physical blows, at least. But emotional ones—and recoveries from them—are why Blimp remains cinema's most convincing testament to friendship. A middle sequence plays out against a backdrop of World War I. There is a falling out between the two men over cultural divides, divides made all the more pronounced in wartime. Candy meets a nurse, also played by Kerr, and seeing in her the woman his best friend married, he makes her his wife. Come the third part of the tableaux, she has died, Edith has died, Theo is an alien in England in the Second World War, and Candy has been axed from service, though he does have a driver who looks suspiciously like—yep, you guessed it, there's Deborah Kerr again. One gets used to the romantic theme, and sees Kerr coming in her various iterations. Which, of course, is exactly what Powell and Pressburger expected. There is solidity there, firm footing for the movie's principal relationship to try and work itself out. The staging feels almost three-dimensional, like you've gained ingress into your television set, with the story playing out all around you. The backgrounds of Blimp invite you to look deep and hard at them: Snow, for example, has a knack of falling when characters are inside, and viewers can direct their gaze to the window to see the descending flakes. Those details are enhanced by a most ambulatory camera; we travel through the air, through windows, through walls. The visual sumptuousness mirrors the bounty of any true friendship, and a most delicate positioning along a line where the quotidian and the magical coexist. Few filmmakers knew how deeply unpredictability factored into friendship, which in turn led to Blimp's knack for making that unpredictability visual in a way no British movie—or any movie, for that matter—has. The camera is an all-seeing eye in the world of Blimp, but we never know, exactly, what it will share with us next, so that what is really a study in friendship gains an aspect of magic that would have made perfect sense to Walt Disney. One of Blimp's most remarkable moments—the moment that could be its Best in Show moment against any sequence from any British film—occurs when Theo sits in a threadbare room with several clerks in the background, an interlocutor in front of him, and makes his case for remaining in England, having fled Germany after the Nazis came to power. He gives his reasons. They are strong reasons. They are deemed, by the interlocutor, not good enough. He resolves to start again, prefacing his remarks by saying that in the first instance, he did not lie, but he did not tell the truth, though he will say his truth now. He does so for three of the most intense minutes in all of filmdom, in a single, uncut take, which is the cinematic equivalent of the epic—but intimate—close of Joyce's "The Dead." The pace of his words never varies, and never has a camera felt more like a recording console. Out of that stillness, from the left of the frame, comes the kind of emotional payoff, made visual (let's just say a most unexpected fellow appears). And, frankly, any viewer needs that payoff, after that speech, in that moment, in the same way that you need a friend to pick up the phone because of whatever had just gone down in your life. Powell and Pressburger replicated that feeling, that emotional aesthetic, in most of their best works, but not quite with the range and drama of Blimp. It is, in a sense, a cinematic White Album, with weird back corridors and asides that you think are mere asides but that lead to moments you could not have seen coming five minutes, or two hours, prior. It helps to have a capacity for wonder when you sit down with a film like this. But should you not find yourself so equipped, one will be provided, courtesy of the Archers, for the whole of this viewing session, at least.